An analysis of moon rocks has confirmed that it has the same basic composition as the earth. Around 9:00 p.m. Mountain Standard Time on September 29, the moon will be full. It is an attention-grabbing moment out here in the West where the night sky is typically so clear. It has begun to bring up a lot of “Did you know . . .?” information that I have only recently acquired. I find it very embarrassing to admit how out of touch I have been with the moon for most of my life. In fact, it was on an evening walk with my dog soon after settling in Santa Fe in 1999 that I first became conscious of the “dark of the moon.” I have a lot of imagination, and when I failed to locate even the faintest sign of its presence in the night sky, I wondered if something had happened. 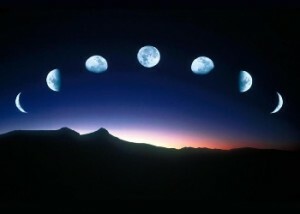 How can an educated person be so ignorant, so unaware of the phases of the moon? I guess the rejoinder could be, “What difference does it make?” Maybe it’s just a way to tune in to the natural world that would provide important perspective right now. In that regard, I’m also way behind in my reading of Rachel Carson, but I recently acquired a copy of The Sea Around Us. First published in 1950, it contains a vivid description of the potential origin of the moon. Carson’s theory was that centrifugal force hurled a great wave of our molten planet out into space, and that became the moon. Now the reigning idea is that early in the earth’s history–about 4.5 billion years ago–another smaller planetary body collided with it and sent debris flying, some of which coalesced into the moon. An analysis of moon rocks has confirmed that it has the same basic composition as the earth. When Rachel Carson wrote her book on the sea, she believed that the moon’s creation left a great crater on the surface of the earth that became the basin of the Pacific Ocean. I suppose this could also work with the collision theory, and it creates an interesting sense of intimacy. When the moon is full, we are looking at a bright disk that was once a part of earth, and its departure may have left a scar deep beneath the ocean. I felt a little sad to learn that the moon’s distance to the earth increases by 38 mm a year. On the other hand, what a relief that solar radiation makes it impossible for water to persist on the moon, which also makes human habitation unlikely. And Russia and the United States signed a treaty in 1967 which defines the moon as the “province of all mankind” and bans weapons of mass destruction. In 1979 a Moon Agreement was created to restrict the exploitation of its resources by any single nation, but it has not been signed by any nation capable of space travel. All in all, though, I feel an even deeper appreciation of the moon’s bright presence after learning these few things. I never thought about this either, but it apparently almost always shows us the same side. As people have looked at it in full down through the ages, we have most commonly imagined a face or a rabbit created by its shadows. Whatever. I’m just glad it’s there and safe from us for a while.